There are many good golf courses within 30 to 90 minutes of Icandi Hideaway which makes it the ideal base for your golfing holiday in Thailand. The nearest is the newest course, Banyan Golf Club, 30 minutes drive from Icandi. Designed by Pirapon Namatra, it is a lovely golf course with views of Sleeping Lion Island from the 9th & 13th greens and has a wonderful Thai teak clubhouse. 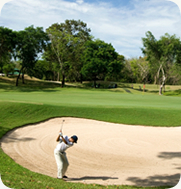 Palm Hills Golf Course is a 40-minute drive just outside Hua Hin town. Designed by Max Wexler, this course opened in 1991 and is a very popular course. It has two distinct nine-hole sections and is designed around lakes and escarpments. There is also a driving range plus chipping and putting greens. Black Mountain Golf Course was designed by Phil Ryan and opened in April 2007. Natural creeks run throughout the course and it overlooks the wonderful Black Mountain range. Imperial Lake View was designed by Roger Packard and opened in 1993. It was built in an area originally known for pineapple production and there are thousands of palms and native trees on the undulating hills throughout this course. Springfield Royal Country Club & Golf Course. 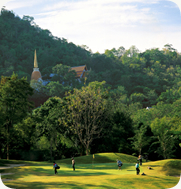 The course was designed by Jack Nicklaus and is considered one of the finest in Thailand. It was the venue for the 2000 Thailand Open and is a 90-minute drive from Icandi.